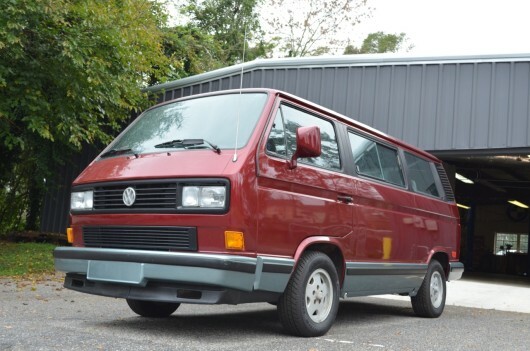 Found here on eBay is a 1984 Volkswagen Double Cab Transporter. 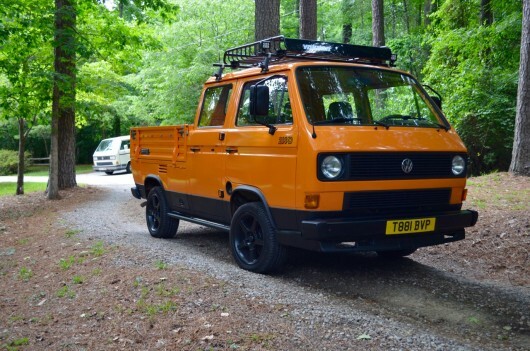 This Doka started life in Europe but was brought over by a previous owner to roam the roads of the Southeast. The Doka has recently been repainted in its original Brilliant Orange color. The paint shines very well and there is zero rust anywhere on the truck. The bed, fold down inners and lower ¼ sections have all been sprayed with bed liner to guard against stone chips. The 1.9l Wasserboxer runs well and breathes through an original Solex carburetor. The exhaust will need replacing as it has a couple holes however it does not leak oil or coolant. The 4-speed manual transmission shifts smoothly into all gears. Inside, things are in nice shape for a utilitarian truck. The original front seats have a couple of cracks as does the rear bench. The floors, rubber mats and door cards are all in good shape. The Doka shows 86k kilometers (still metric) though the odometer may have rolled once putting the mileage more likely at 111k miles. Up top, a custom Yakima roof rack will give you plenty of room to stash anything needed for a weekend camping trip leaving the bed open for bikes, boats, etc. The Doka is sitting on 17” five star alloy wheels with 215/50 tires that have plenty of life left in them. Load up this rare piece of German iron and hit the road for your next adventure. 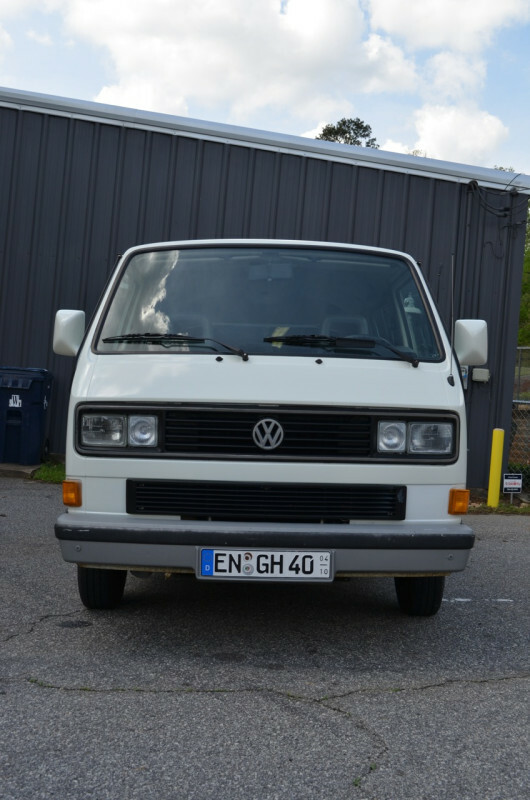 The Transporter has a clear Georgia title and is located in Athens, GA. Feel free to email with questions. 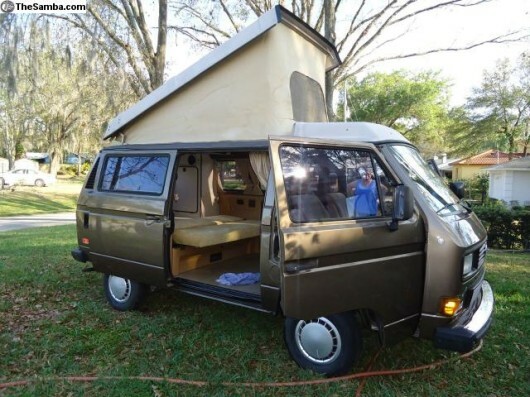 Found here on The Samba is a very original 1991 Vanagon GL. This GL was built in the same Graz, Austria factory that built most of the Syncros. 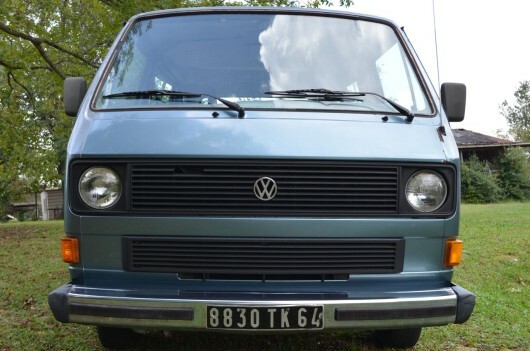 By ’91 production was winding down on the venerable T3 and van production had moved to Austria. 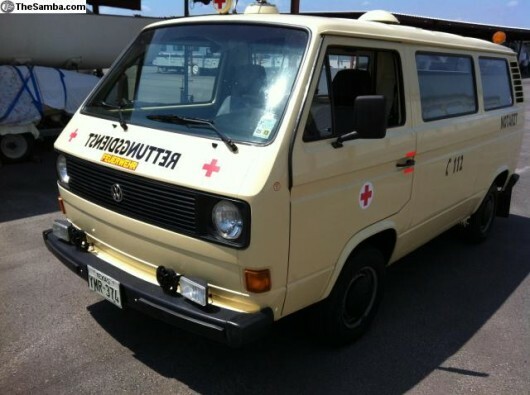 This particular Vanagon has just over 146k on the clock and runs strong. The stock 2.1l fires right up and pulls well. The 3 speed automatic transmission upshifts and downshifts smoothly. The cruise control and power door locks function properly. The A/C blows but could probably stand a charge. The body is in great shape with no rust underneath or at the seams. The Hankook tires have plenty of life in them and the Pastel White paint shines. A trailer hitch has been added for light towing or a bike rack. Inside the grey cloth/vinyl interior is in good condition with no tears. The front carpet is original and in good shape. The rear carpet shows some wear but is intact. The Panasonic In-dash CD player works properly and plays through stock speakers. All gauges and lights function properly. In the back the rear seat folds flat into a bed and the center seats flip forward. Recent work includes a new muffler, exhaust seals and new valve cover gaskets. The bus is in Athens, GA. Feel free to email with questions or to arrange a time to come and see it.